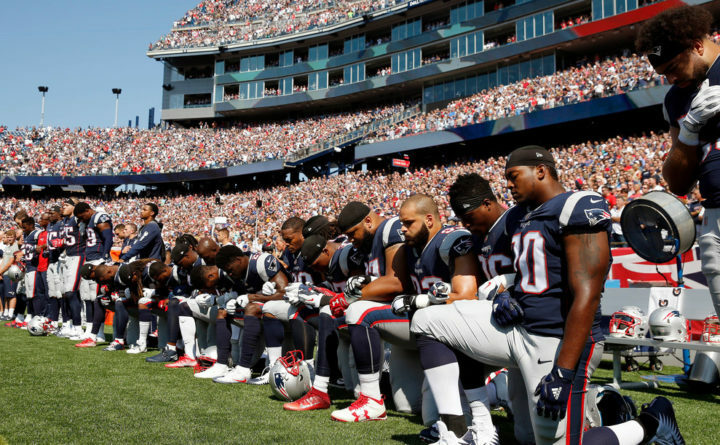 Several New England Patriots players kneel during the national anthem before an NFL football game against the Houston Texans in Foxborough, Massachusetts, Sept. 24, 2017. ATLANTA — NFL owners approved a new policy Wednesday aimed at quelling the firestorm over national anthem protests sparked by Colin Kaepernick and polarized by President Trump, permitting players to stay in the locker room during the “The Star-Spangled Banner” but requiring them to stand if they come to the field. Commissioner Roger Goodell said the change was approved unanimously by the owners at their spring meeting in Atlanta, but even that was up for debate. The head of the San Francisco 49ers — Kaepernick’s former team — said his franchise abstained from the vote. CEO Jed York said he wasn’t comfortable with a process that didn’t directly involve the players. “I want to work with my team to make sure everything we do is about promoting the right types of social justice reform and getting to a better America,” York said. The NFL Players Association said it wasn’t consulted about the new policy and would challenge any changes that violate the collective bargaining agreement. Clearly, Goodell and most owners just want to put the issue behind them. In the surest sign that players were not part of the discussions, any violations of the policy would result in fines against the team — not the players. That could be a way to avoid legal challenges from the players’ union, since fines against a team would not be subject to collective bargaining. The league did say teams could impose their own workplace rules for those who fail to show respect for the flag and anthem, but didn’t say what those policies might be. Because the new policy is a change in the terms and conditions of employment that was not collectively bargained, any attempts to fine individual players who continue to protest in public would surely be opposed by the union. The owners spent several hours addressing the contentious issue — which made it all the way to the White House. Kaepernick, the former 49ers quarterback, began kneeling during the national anthem in 2016, a quiet but powerful protest against police brutality and racial inequities in the justice system. Other players took up the cause, and the gesture carried on during the 2017 season even after Kaepernick left the 49ers and failed to land a job with another team. Trump turned the debate into a campaign issue , saying the NFL should fire any player who takes a knee during “The Star-Spangled Banner.” The NFL hasn’t gone that far, but Kaepernick has yet to land another job and one of his former teammates and fellow protesters, safety Eric Reid, is also out of work. Both have filed collusion grievances against the NFL. While the owners touted the change as a compromise that everyone should get behind, the union expressed immediate skepticism. York said he intended to meet with his players to discuss the change. The NFL started requiring players to be on the field for the anthem in 2009 — the year it signed a marketing deal with the military. But owners sent a bit of a convoluted message with the new policy, appeasing those who feel the national anthem must be treated with reverence, while allowing some sort of conduit for players to protest as long as they stay out of the public eye. York said other initiatives were in the works, including a suspension of all concessions sales during the national anthem . Steelers guard Ramon Foster shrugged his shoulders when asked about the new policy, saying the owners will always hold an upper hand over the players. Goodell took a more conciliatory path. He insisted the league met with countless players over the last year to get their input on the fractious anthem debate anthem, which some have even pointed to as a major reason for the NFL’s declining TV ratings. Goodell was asked who would get to decide what actions would be considered disrespectful to the anthem or the U.S. flag.